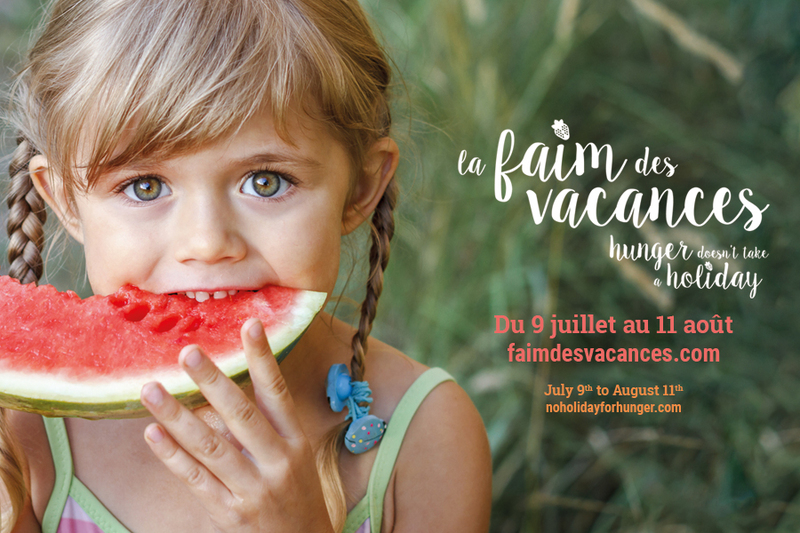 MONTREAL, July 9, 2018 – For the third year in a row, Moisson Montréal launches Hungry for Vacation, which will take place from July 9th to August 11th. At this time of year, one dedicated to rest and festivities, Moisson Montréal would like to remind everyone that hunger doesn’t take a vacation for many people. During the summer, many families on the island of Montreal suddenly have fewer food resources available to them because they can no longer benefit from school food aid or various programs that suspend their activities during the summer season. Moisson Montreal’s accredited partners see the demand for their support increase, and so our reserves empty quickly. “Thousands of families struggle to eat while there is so much food waste. Join our social solidarity chain and let’s make a difference for youth in need”, says Richard D. Daneau, Moisson Montréal’s Executive Director. We estimate that 39,000 young Montrealers between the ages of 3 and 17 rely on some sort of food assistance. To help youth and their families, Moisson Montréal has set itself the goal of raising $60,000 in one month. At the same time, Moisson Montréal is mobilizing to provide snacks or lunches during 8 weeks to 11 summer camps located in disadvantaged areas of Montreal. This program will positively impact 1006 children every day. Donate via noholidayforhunger.com. Each monetary donation of $1 enables us to distribute $15 worth of food. Participate in Texting Tuesday on July 24th by texting MOISSON at 20222 and make a $10 donation. Rendez-vous at La Ronde on July 24th and 25th and make a $15 donation or donate 6 non-perishable goods to enjoy a 40% discount on the daily ticket price ($25 plus taxes). Founded in 1984, Moisson Montréal is the largest food bank in Canada. Through its centre for collecting, sorting and distributing emergency food assistance, the organization supplies 241 accredited community organizations on the Island of Montreal. In turn, these organizations provide food assistance to nearly 137,000 people, including 41,500 children each month. Moisson Montréal distributes annually 15.6 million kg of food, representing a total value of nearly $85 million.